IN DEEP SORROW MY FAMILY AND I REGRET TO ANNOUNCE THE PASSING OF OUR BELOVED FATHER SUPREME GRANDMASTER (SGM) CIRIACO “CACOY” DELA CUESTA CANETE. 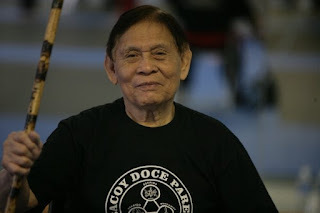 SGM CACOY WAS THE LAST FOUNDING LEADERS OF THE OLDEST ESKRIMA ORGANIZATION IN THE PHILIPPINES - DOCE PARES. MOREOVER HE WAS THE LAST OF THE GREAT ORIGINAL TEACHERS AND DEVELOPERS OF THE UNIQUE FILIPINO COLTURAL ART OF ESKRIMA THAT TRACES BACK TO LAPULAPU. HENCE HE WAS THE LAST OF THE MOHICANS. HE EXPIRED THIS EVENING, FEB. 5, 2016 AT EXACTLY 8:08PM. COINCIDETALLY HE WAS BORN ON 08-08-1919. HE WAS 96 ½ YEARS OLD. 21 GUN SALUTE CEREMONY IN HONOR OF THE LATE CAPTAIN CIRIACO “CACOY” CANETE. THANK YOU FOR ALL OF YOUR CARING THOUGHTS AND PRAYERS. WE WILL MISS HIM SO DEEPLY. Vá em paz grande mestre! Obrigado por tudo!